You can use the Polyline tool to draw complex segmented lines or curved lines by creating each point constituting the line. 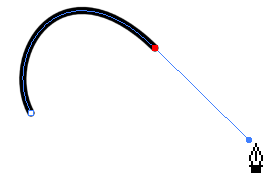 Click to create a point with no Bezier handles. 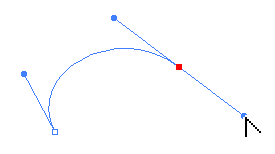 Click and drag to create a point and its Bezier handles in the same stroke. Hold the Alt key to only change the angle of the outer handle, and leave the inner handle at its current angle. Hold the Shift key to lock the angle of the handle at every 15 degrees. Click or click and drag somewhere else to create the second point in your line. A line will be drawn between the first point and the second point. Repeat the previous step until your line is complete. While holding Ctrl (Windows) or ⌘ (macOS), click anywhere in the drawing space to release the Polyline tool from the line you've been building. You can then start building a new line. If you want to make adjustments to the line you created, you can use the Contour Editor tool—see Reshaping with the Contour Editor Tool.